Election Day produced historic results, including the victories of Ayanna Pressley and Jahana Hayes, who are now the first black women to represent our region in Congress. 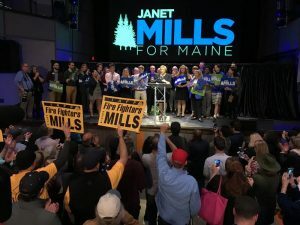 In addition, Janet Mills became the first woman to be elected Governor in Maine, and Chris Pappas became New Hampshire’s first openly gay member of Congress. 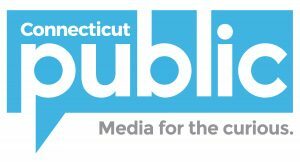 Khalilah Brown-Dean, an Associate Professor of Political Science at Quinnipiac University stopped by the Next studios to speak with John Dankosky on what these historic election victories mean for region in the years to come. These interview highlights have been lightly edited for length and clarity. John Dankosky: We never had an African-American woman represent any of the New England states in Congress, and now we have two. How significant is this? Khalilah Brown-Dean: I think it’s major, not just for Congress, but for these two states that have had a history of battles over issues of race, and also gender and class, to now elect these two women. It’s also a moment for us to reflect, and ask ourselves why it took us until 2018 to break this kind of barrier, and what will it mean for candidates who come after Ayanna Pressley and Jahana Hayes. 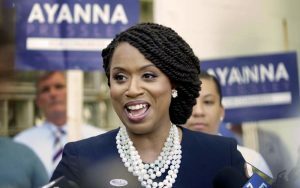 Ayanna Pressley, a very popular and a very powerful Boston City Councilwoman, is someone who built a political career, and she’s going to represent the Seventh District Congressional District of Massachusetts, which is the only majority-minority district in the state. She’s the perfect candidate to take that leap, because she’s really made a career of serving the people in that district. She’s made a career serving people in the district, but she’s also had to fight some really tough battles within communities of people saying we’re okay with having an African-American representative, but we’re not sure about having an African-American woman. And part of the story overall is that often we equate women’s leadership with white women, and we equate black leadership with black men. So Ayanna Pressley has faced those battles both within and across communities and really established herself as a politician who can build those bridges. 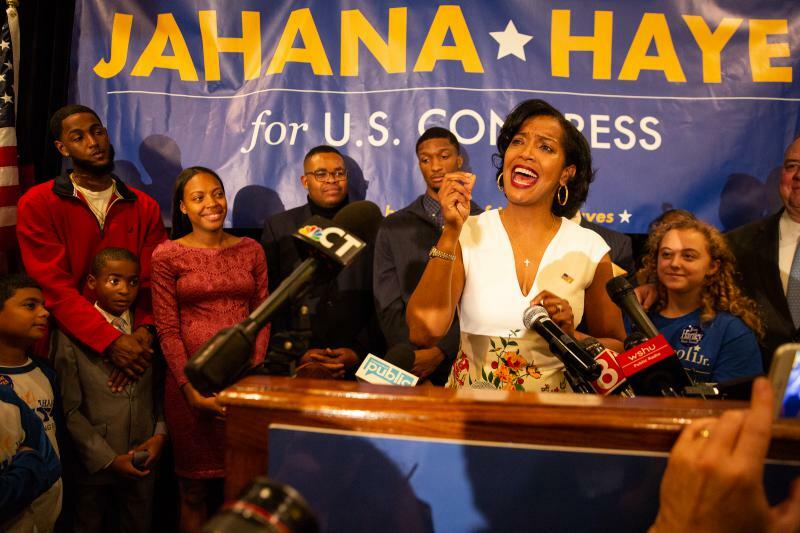 Jahana Hayes, in Connecticut, is not a politician. She grew up in Waterbury, Connecticut, she was a single mom, she was a teenage mom. She had a lot of poverty and troubles in her background and she rose up to become the national teacher of the year. This is a different path to Congress. It’s a different path to Congress, but it’s also the American dream. That here is someone who worked really hard, who invested in education, invested in herself, and didn’t give up. That is the story that I think is most familiar to people, not everyone has a position handed to them, not everyone inherits money and resources and connections to be able to do that. I think her approach to issues in Congress may be different from Pressley’s, but it will come from the same perspective of community empowerment, not just self-advancement. What does it say about old, stodgy New England, which is also blue, progressive New England, that it took us this long to finally have black women serving in Congress? It could have happened [sooner], and it should have happened, but it didn’t, and we have to ask the question of why. As someone who grew up in Virginia, we always thought of the North as being this progressive place, and then we realized in many ways New England is simply up-South. So at the same time that we are electing these women in Massachusetts and Connecticut, you had a black woman Representative in Vermont decide that she would not continue running because of the death threats she received and her family received. So while you have two candidates, two places that have embraced that difference, there are still places across New England, where difference is seen as a threat, and when you disrupt the status quo, people respond in bizarre ways. And I’ll say, you are a black woman from the South, in academia in New England, the heart of academia in America, so you speak from some experience. I do. I’ve experienced that, of people questioning my ability, I still have people who can’t believe that I’m a tenured professor, and they think it’s a compliment to say, “You’re so articulate.” Well, I do have a PhD, so that comes with the territory. But part of how I approach it and how these women as candidates are approaching it is, is understanding that this is different for many people, and how do you find that common ground. That’s even more important in politics because you want to get things done. You don’t want to just be there just for who you are, but because of what you do. 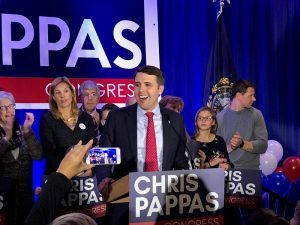 Janet Mills became the first female governor of Maine, and Chris Pappas becomes the first openly gay member of Congress from New Hampshire. We see an awful lot of diversity sweeping across elected officials in America, and also here in New England. Jahana Hayes was criticized for saying, “If Congress looks like us, they can’t stop us.” And what we’re seeing is the “us,” represents so many groups. We’re all members of multiple groups at once. So this intersectional approach of saying let’s look at race, let’s look at gender, let’s look at gender identity, let’s look at sexual orientation, and understand that everyone has gifts to bring to these spaces, and how do we create spaces, how do we create institutions that affirm that and don’t try to limit what we expect of people, especially across partisan lines. When someone says, “I want representatives that look like us” and you’re a black women, the first thing that most of white America think is, “Well she must be talking about blacks and women.” But it’s these multiple varied stories that we don’t have time for when we have these quick political conversations that we’re always having. I always say when people respond negatively to a Jahana Hayes comment that Congress should like us, what is it about that comment that offends you? Do you see that saying that it should like like us makes you feel like you’re not included, and that’s a bias, we all have biases, that’s a bias that we have to interrogate? This country is changing, it’s changing in remarkable ways and we can either embrace that change or be fearful of it. I choose to embrace it. What does this look like in a couple of years if we’re not talking so much about firsts, but we’re talking about New England representation in Congress and State Houses that looks a little more like the new New England? It’s great to be the first, it’s detrimental to be the only, and that is where these candidates face a challenge, so that if you break this barrier and you’re in the first in that structure, but you’re not working in a way to substantively represent the interests of people in New England, it really doesn’t matter, and you end up being a one-term candidate, or a one-term politician who can’t convert that into strength. And these candidates often enter into institutions that are often hostile to their very presence. They have to build coalitions, they have to work across barriers, because at the end of the day, that’s what gets you back into office. This is an edited interview from the November 8, 2018 episode of NEXT. You can listen to the entire show right now. Find out when NEXT airs throughout all of New England.